PUYALLUP, Wash. - July 11, 2017 - PRLog -- PodSilo by MollieSoft is a Windows application program that allows you to use RSS (Really SImply Syndication) podcast feeds to automatically schedule the download of new podcast episodes. 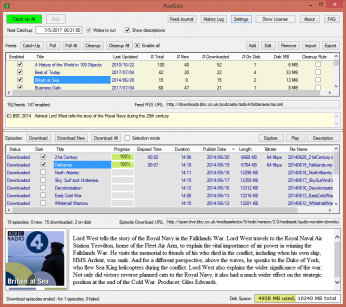 From softpedia.com: "PodSilo is a tiny tool designed to help you automatically download and manage podcast RSS feeds so that you never miss out of the latest content from websites and blogs...A reliable podcatcher for downloading and managing feeds...if you are an avid listener of a certain podcast, you will be happy to learn that you can also schedule downloads, so the app grabs them as soon as they are released. In case you are worried about the storage on your PC, then you should bear in mind that you can configure the app to delete content after a given interval." PodSIlo is available as a 60-day free trial at http://www.molliesoft.com/podsilo. A permanent license costs only $9.95 US. MollieSoft makes useful software for Windows PCs. WinSleep by MollieSoft is a Windows utility that allows you to sleep or hibernate your computer based on CPU/Disk/Network usage limits as well as a time schedule. Its unique feature is a timeline graph that shows you when your computer has been awake, asleep, or hibernating over the last several days (or weeks).